Estate: Wine production in the Carmignano region of northern Tuscany dates to around 1000 B.C. when the Etruscans inhabited the area. The Capezzana estate, located 20 km from Florence, on the slopes of Monte Albano and close to the Tuscan-Emilian Apennines, has been making wine for over 1200 years. A preserved rent contract now in the Florence Archives details the production of wine and olive oil specifically at Capezzana, dated 804 AD. Since the 1920’s, the Contini Bonacossi family have owned and run this celebrated, historical estate. Today, the estate consists of 670 hectares, of which approximately 100 are vineyards and 140 are olive groves. 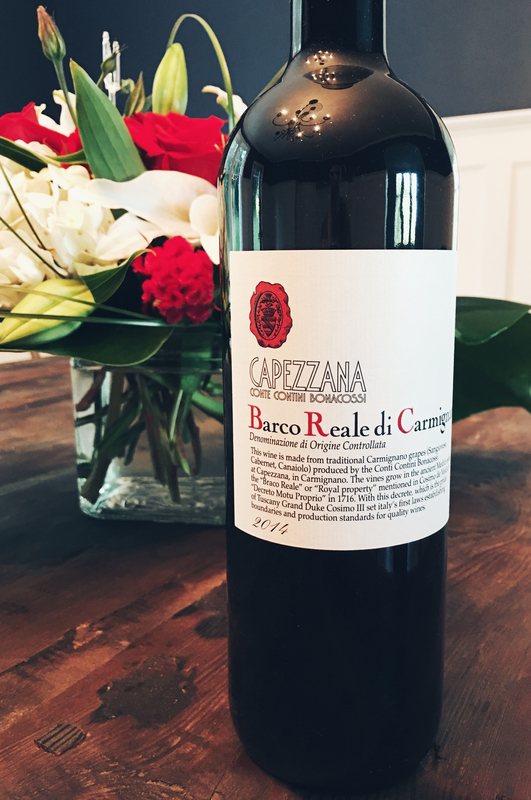 Barco Reale di Carmignano is the estate’s “everyday wine”, although grapes are from vineyards in historic Medici Royal lands, from the property “Barco Reale” or “Royal property” mentioned in Cosimo de Medici’s “Decreto Motu Proprio” in 1716 [where it takes its name from]. Winemaking: Sustainable viticulture. Fermented in stainless steel tanks, aged in Allier barrels for 6 months, followed by at least 3 months in bottle prior to release. Tasting Notes: Transparent garnet in colour with inviting aromas of cherry, strawberry, autumn woods and spice. Rich cherry and strawberry fuse with an undercurrent of sour cherry and woodsy spice. Smooth tannins and peppery spice highlight the dry, fruity finish. Well balanced and super versatile at the table. Wine Pairing Suggestions from the Winery: Wonderful with first courses, pastas and red and white meat entrees. Estate Bottled by Tenuta Capezzana S.R.L.